Comair Flight 5191, marketed as Delta Connection Flight 5191, was a scheduled United States domestic passenger flight from Lexington, Kentucky, to Atlanta, Georgia, operated on behalf of Delta Connection by Comair. 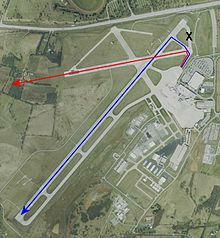 On the morning of August 27, 2006, at around 06:07 EDT, the Bombardier Canadair Regional Jet 100ER that was being used for the flight crashed while attempting to take off from Blue Grass Airport in Fayette County, Kentucky, 4 miles (6.4 km) west of the central business district of the City of Lexington. Based upon an estimated takeoff weight of 49,087 pounds (22,265 kg), the manufacturer calculated that a speed of 138 knots (159 mph; 256 km/h) and a distance of 3,744 feet (1,141 m) would have been needed for rotation (increasing nose-up pitch), with more runway needed to achieve lift-off. At a speed approaching 100 knots (120 mph; 190 km/h), Polehinke remarked, "That is weird with no lights" referring to the lack of lighting on Runway 26 – it was about an hour before daybreak. "Yeah", confirmed Clay, but the flight data recorder gave no indication either pilot tried to abort the takeoff as the aircraft accelerated to 137 knots (158 mph; 254 km/h). Comair discovered after the accident that all of its pilots had been using an airport map that did not accurately reflect changes made to the airport layout during ongoing construction work. The National Transportation Safety Board (NTSB) later determined that this did not contribute to the accident. (p99–100) Construction work was halted after the accident on the orders of Fayette Circuit Judge Pamela Goodwine in order to preserve evidence in the crash pending the inspection by safety experts and attorneys for the families of the victims. ^ a b c d e "Report of Aviation Accident, Comair Flight 5191, NTSB/AAR-07/05" (PDF). National Transportation Safety Board. Retrieved July 26, 2007.